Mornings are full of sounds in Malinalco, roosters, dogs, birds and church bells. Around 8:00am we start down a steep stone street to the covered courtyard restaurant where we meet for meals. 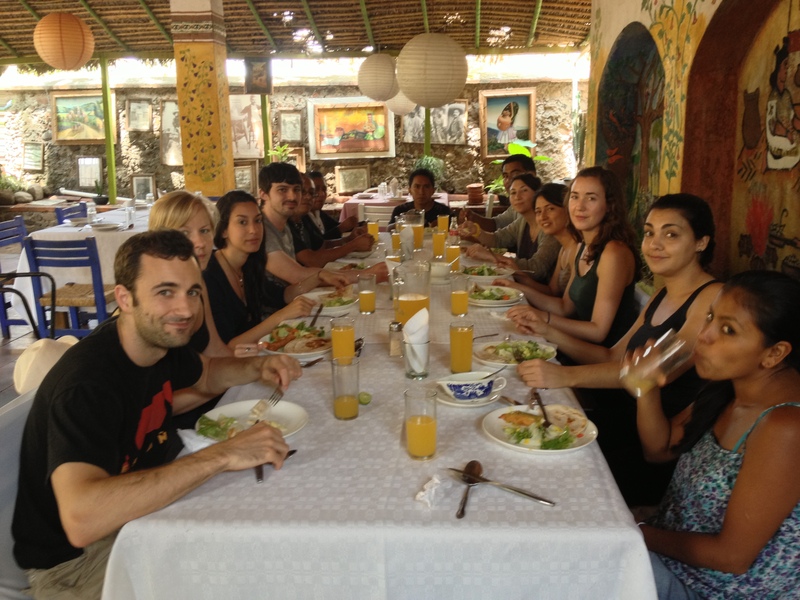 We have fresh fruits and Mexican food that is freshly prepared for us. Then we walk along the main street past the large church and the town square to the Casa de Cultura where our workspaces are. 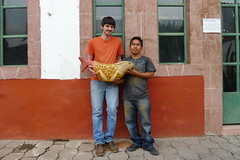 We are in full swing with our project here in Malinalco. 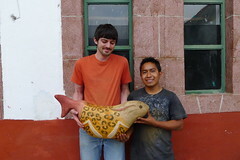 It has been remarkable to collaborate with the artisans. We all have been working to combine the deep cultural roots and skillful expertise of the artisans with our own contemporary design sensibilities. We have a number of native Spanish speakers and a number of Americans who speak Spanish very well so communication is smoother for them. Others of us have found Google translate on our IPhones and in combination with drawing, demonstration and help from the Bilingual designers manage to communicate. It is a dance of discovery that is truly a melding of ideas and cultures. I find it quite moving to look at the work in progress and to observe the process evolving as the designs come into being. The artisans are gracious and patient and joyful. We are getting to know each other. Designers and artisans are using a variety of materials from wood, to different types of weaving materials, to steel, stone and bone from the butcher shop. I am paired with Claudia who is sharp, energetic and articulate. We amuse others by our communication process, because we seem to understand each other quite well with me speaking a mix of Frenish (French and un poquito Espagnol) and English. Sometimes our conversation consists of Claudia speaking Spanish and me English and we understand each other. 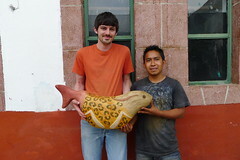 It has been an adventure to find the craftspeople in addition to the artisans needed to fabricate our pieces. Few people have telephones and to locate someone a walk around the town is necessary. Claudia and I designed a lamp requiring a welder. A number of the other designers need welding too. Yesterday a few of us set out to locate a welder who was home. We walked to one with no luck, to another who was not home but who would be back in 20 minutes and then in the meantime Claudia, who knows everybody, found a third welder who was home but was too busy to work with us. In NY we would pick up the phone or go on the Internet to source our materials and craftspeople. We joke about needing McMasterCarr.com (a hardware website we use that has next day delivery and a huge inventory). We have a lot more work to do to complete our products before Monday when we fly back to New York.